SIS LIVE: KA-band SNG contract with ITN and ITV. Milton Keynes, November 2013: Leading connectivity expert SIS LIVE has signed new contracts with ITV and ITN for the supply of satellite newsgathering (SNG) services. This new seven year agreement includes the provision of a highly-specified fleet of 18 HD SNG vehicles, downlinks, IP systems and satellite capacity, to facilitate ITV and ITN’s satellite news gathering requirements in the UK. SIS LIVE was awarded the contract after a highly competitive tender process which sought out the best operational, technical and most cost-efficient solution. SIS LIVE has an unrivalled pedigree in the delivery of end to end HD SNG services for a number of high profile clients, including 20 years of working with ITV and ITN. It owns and operates the largest uplink fleet in Europe, with over 500 MHz of permanently leased satellite capacity and a comprehensive connectivity infrastructure which includes two large broadcast teleports/MCRs and a national fibre network. Combined with the expertise and experience of its engineering teams and its network of bases across the UK, the quality and breadth of services it offers are unrivalled. SIS LIVE already has the lightest, most flexible vehicle mounted satellite system in the world with the uPod product. The reduced weight compared to competing antennas allows for more baseband equipment to be installed in smaller units and maximizes the full potential of the SNG vehicle. ITV and ITN led the way with SISLink back in 2004 with the provision of automated uPod antennas which changed the way satellite news gathering was delivered and, since then, uPod has continued to evolve and develop for both the broadcast and government markets. For this new contract SIS LIVE has produced a high stability lightweight Ka band antenna that will be included in all of the SNG vehicles and will provide the core of the ITV / ITN service. An exciting new development to SIS LIVE’s service offering is the extended provision of IP services, of which ITV and ITN will be the first beneficiaries. A new iDirect hub at MediaCityUK will work alongside existing SIS LIVE iDirect services from Milton Keynes, providing greater resilience and additional new functionality. This includes a SIS uBook system that dynamically allocates bandwidth between DVB and IP carriers, ensuring that the satellite capacity usage is maximized at all times. 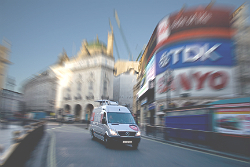 This effectively transforms the ITV and ITN fleet into “news bureaus on wheels”, delivering “source to studio” file based content alongside breaking live news. The multi-satellite hub will provide iDirect-based IP services to well over 100 SIS LIVE uplink vehicles with 20 new Ka band uplink units to be delivered from 2014. Creating a DVB SNG service on SES Ka band satellite capacity differentiates SIS LIVE from the competition, pushing them to the forefront of the market, making innovative use of technology to simplify and reduce cost of their customers’ contribution and delivery. The service will utilise SIS LIVE’s new 8.1m Ka band antenna at its MediaCityUK teleport, with smaller Ka band antennas installed at ITV’s regional bases and ITN’s headquarters on Grays Inn road, providing downlink of signals and local IP connectivity. ITV and ITN will be the first customers to use this service, reinforcing their reputation of being early adopters of innovative new technology, offering both cost and delivery benefits maximising fleet size and UK coverage.